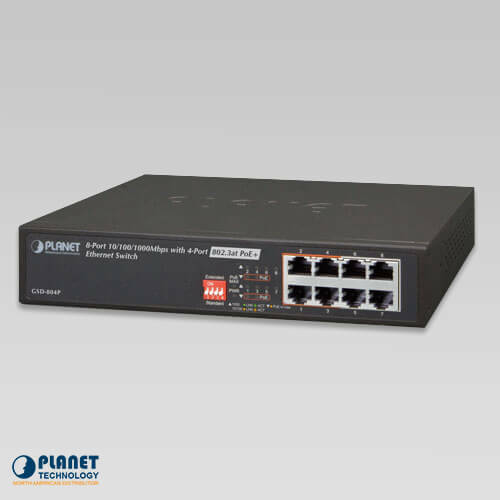 The GSD-804P is a 4-port gigabit ethernet switch with PoE capabilities. 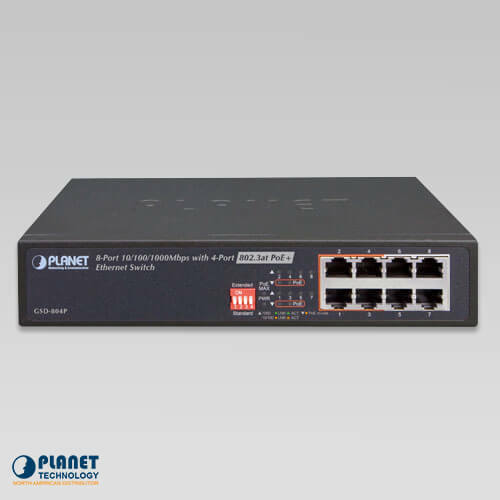 PLANET’s GSD-804P is equipped with eight 10/100/1000BASE-T ports, with four shared 802.3at PoE+ copper interfaces. 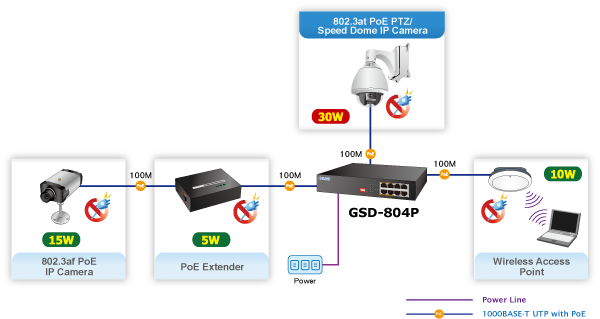 With a total PoE power budget of up to 60 watts and non-blocking data switching performance, the GSD-804P fulfills the demand of sufficient PoE power for HD IP surveillance. 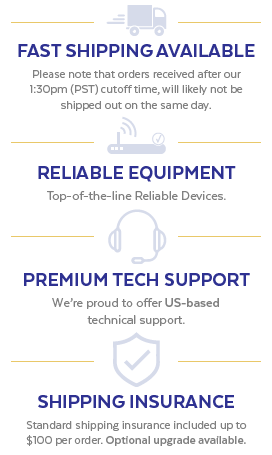 It comes with an 8.5-inch desktop-sized metal housing and reliable PoE power solution suitable for SOHOs, small businesses and system integrators for deploying Power over Ethernet networks. 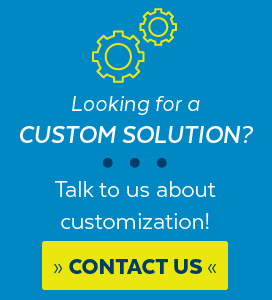 The built-in solid DIP switch provides “Standard” and “Extend” operation modes. 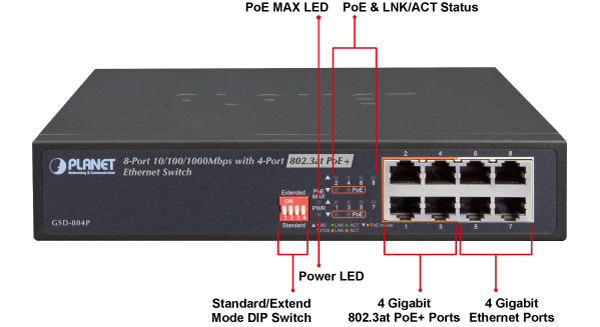 The GSD-804P operates as a normal IEEE 802.at/af PoE Switch in the “Standard” operation mode. 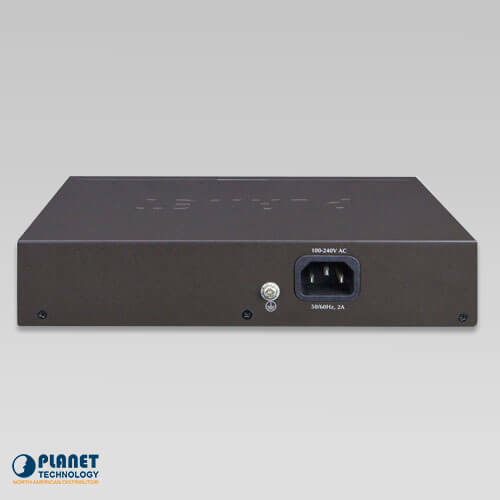 In the “Extend” operation mode, the GSD-804P operates on a per-port basis at 10Mbps duplex operation but can support 30-watt PoE power output over a distance of up to 200 meters overcoming the 100m limit on Ethernet UTP cable. 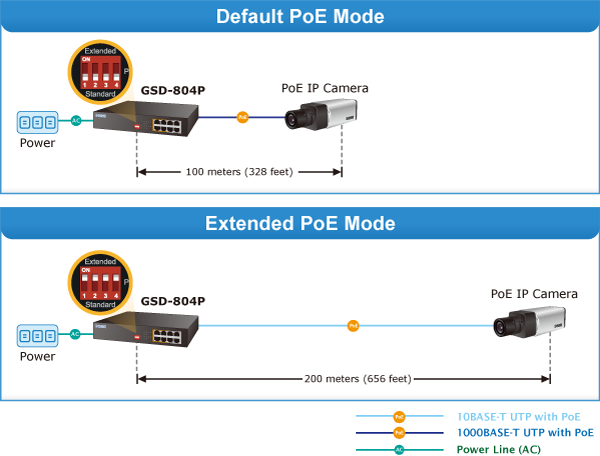 With this feature, the GSD-804P provides an additional solution for 802.3at/af PoE distance extension, thus saving the cost of Ethernet cable installation. The GSD-804P comes with a desktop-sized, compact metal housing, making the placement of the unit convenient. It features a ventilated construction in which a cooling fan is not necessary, thereby making its operation noiseless. The GSD-804P is able to operate reliably and stably in any environment without affecting its performance. The deployment of PoE PDs with constant power feeding can be done easily and quickly. With data switching and power over Ethernet integrated into one unit, the GSD-804P reduces cabling requirements and eliminates the need for dedicated electrical outlets on the wall, ceiling or any unreachable place. A wire that carries both data and power can lower the installation costs, simplify the installation effort and eliminate the need for electricians or extension cords. With 4 PoE interfaces, the GSD-804P is ideal for small businesses and workgroups making the deployment of the PoE facility including wireless access points, IP-based surveillance camera and IP phones in any places easier, more efficient and more cost-effective.